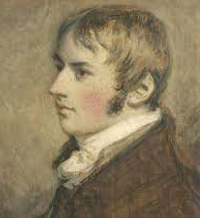 John Constable is, along with Turner, the great figure of English romanticism. But unlike his contemporary, he never left England, and devoted all his time to represent the life and landscapes of his beloved country. About the artist: John Constable (1776 – 1837) was an English landscape painter. Born in Suffolk, he is best-known for his paintings of Dedham Vale, the area surrounding his home – now known as ‘Constable Country’. It was he who quoted, ‘Painting is but another word for feeling’, in 1821. Constable’s most famous paintings include Wivenhoe Park of 1816, Dedham Vale of 1802 and The Hay Wain of 1821. Although his work is now among the most popular and valuable in British art, he was never financially successful during his life. His scenes of ordinary daily life were unpopular in an age that looked for more romantic visions of landscapes. Constable’s style encompasses a freshness of light, colour and touch, and bears the compositional influence of the old masters he studied. He made many full-scale sketches as well as his more famous landscapes. After the death of his wife, Constable became withdrawn and anxious. He cared for his seven children alone for the rest of his life. His art inspired many French impressionists of the late nineteenth century and is still highly regarded today.